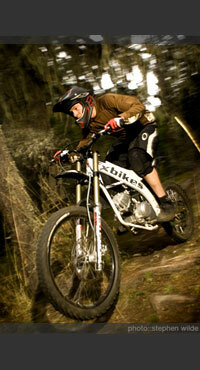 FX Mountain Moto: Auto-Clutch Revolution! FX Bikes offers automatic clutch standard on its 4-speed 125cc Mountain Motos. Shift gears with your left foot without needing to use a clutch, which frees up your left hand to control the rear brake...no more clumsy foot brake! Auto-clutch is slowly breaking in to the enduro and motocross scenes with retrofit kits from Rekluse and others, although to handle all that wild power you need to spend $1000 or so for the kit, then fit it. We've been talking with Rekluse about developing an autoclutch for our more powerful Daytona engines...will keep you posted. Go Pro (Rekluse Pro that is)!